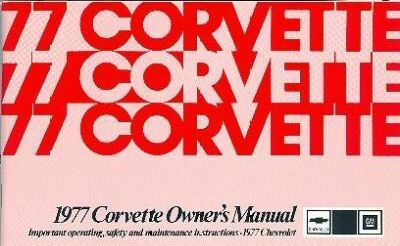 When your Corvette was delivered to the dealer, in the glove compartment was an envelope (plastic or paper depending on the year) containing several items. 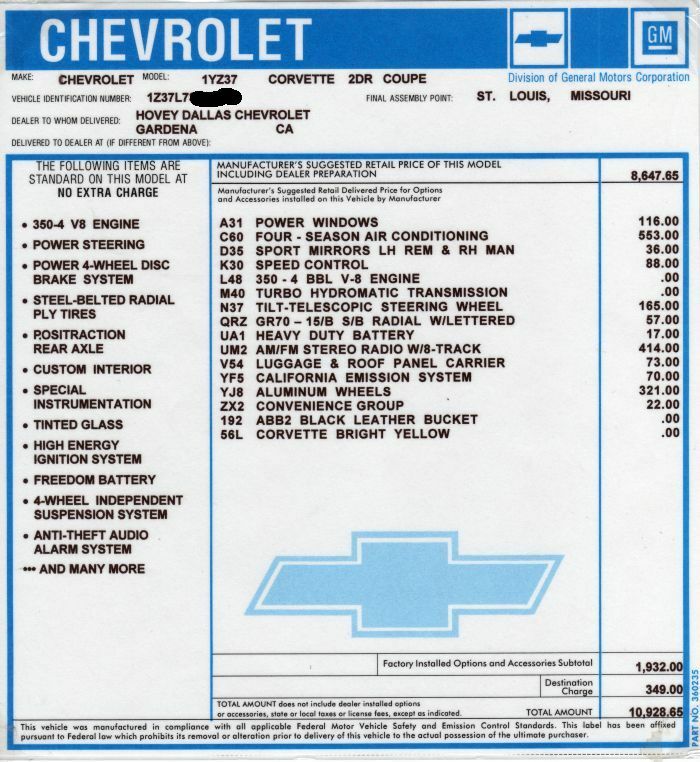 These items included an owner's manual, GM warranty information, tire warranty, battery warranty and other documents relating to options on the car. 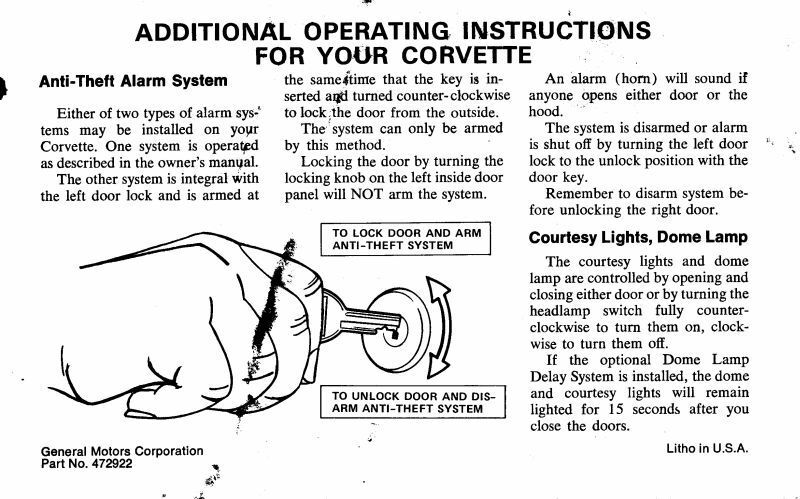 The following documents were included with the 1977 Corvette. I will be adding other years as my documentation collection expands. 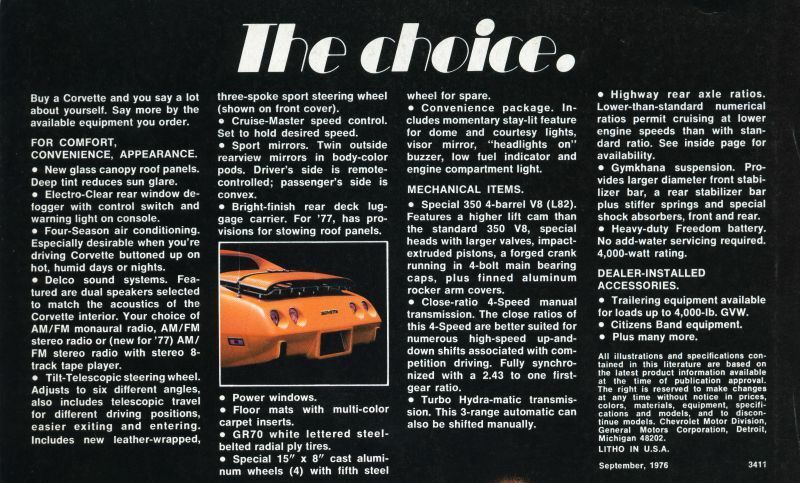 Two different brochures were published for 1977. The very early brochures described the new glass canopy roof panels that were to be offered as an option in 1977. However, due to a dispute with the manufacturer, GM cancelled the option a couple of weeks before 1977 production started. This is an early brochure and lists the glass roof option. This a the later brochure with the glass roof panel option removed. 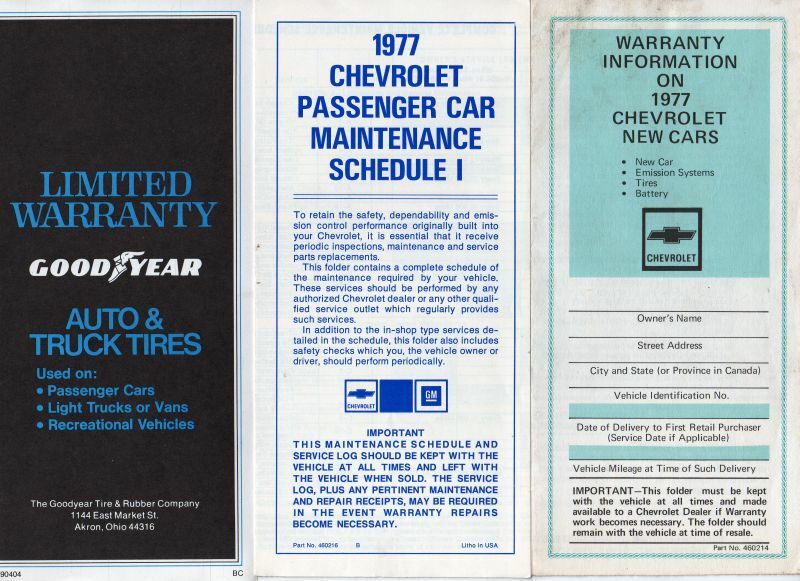 There are also two different versions of the owner's manual for 1977. 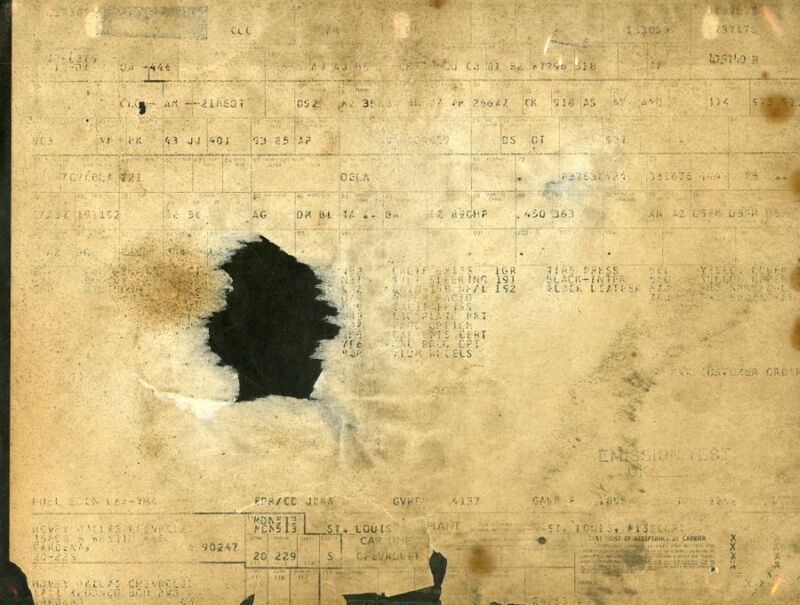 If you check the part number on the back page of your manual, you will see an 'A' or a 'B' following the part number. The earlier cars came with the 'A' version. After the alarm switch was integrated with the driver door lock, the newer manual 'B' was released. The very first cars equipped with the alarm switch integrated with the driver door lock were delivered with the earlier owner's manual. 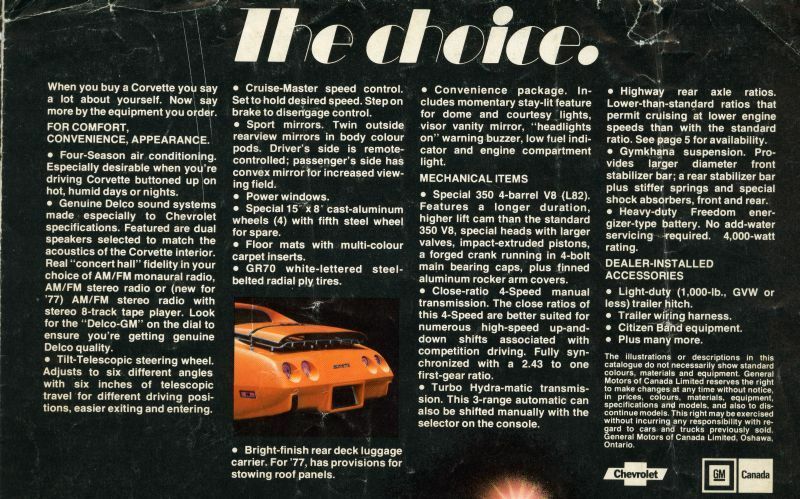 The insert on the left was included with the manual for those cars and was discontinued after the later manual was published. 1977 Corvettes came with either GoodYear or Firestone tires. Depending on the brand, the appropriate tire warranty information was enclosed. The Maintenance Schedule and the Warranty Information information documents were enclosed as well. This is the Firestone Warranty pamphlet. 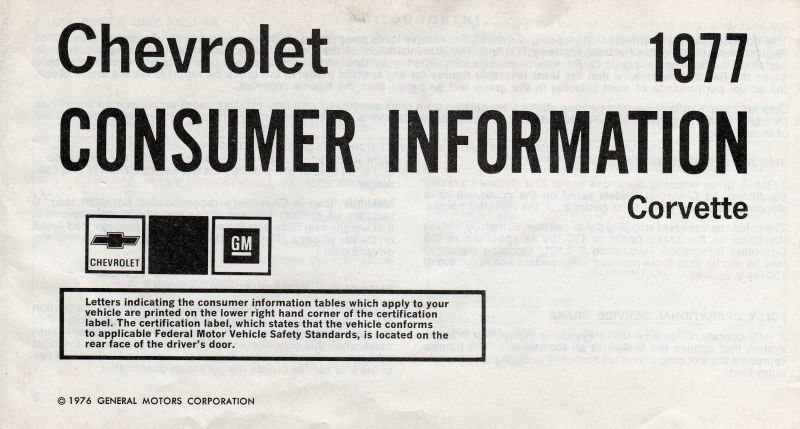 A Consumer Information guide was also included. All cars came with the Delco Freedom Battery and a warranty card was enclosed. If your car came with the cruise control option, the car was delivered with a green card hanging on the cruise lever. This card described the operation of the control. 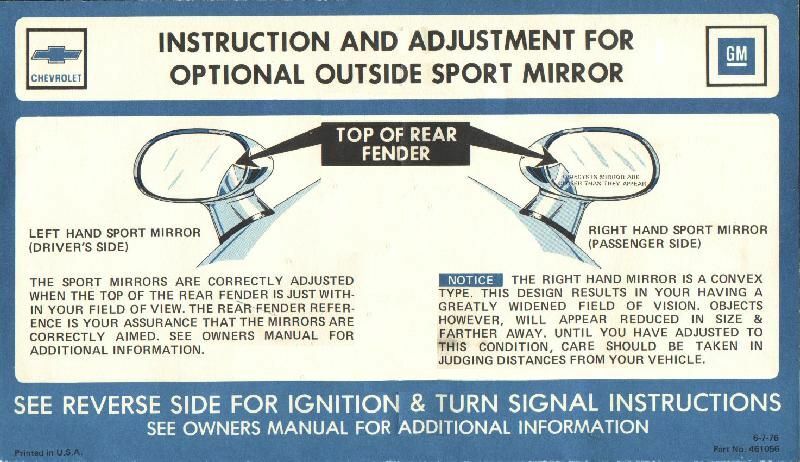 If your car came equipped with sport mirrors, your car was delivered with a sleeve pulled over the driver's sun visor. The operation of the mirrors was explained one side of the sleeve. 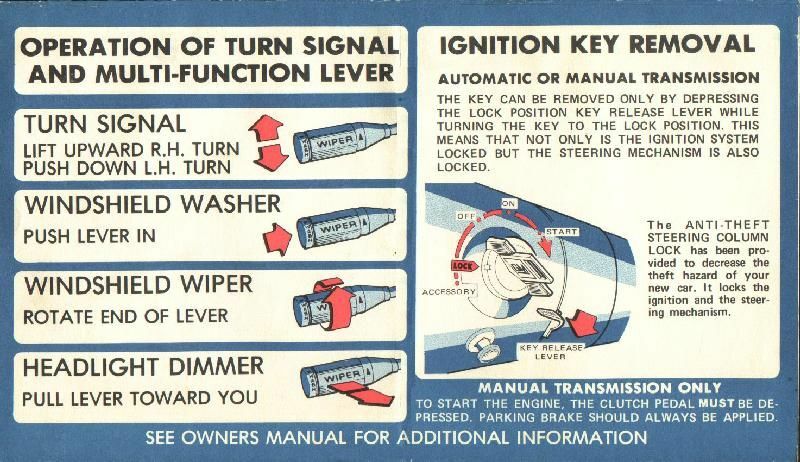 On the other side of the sleeve, the operation of the multi-function turn signal lever was explained. 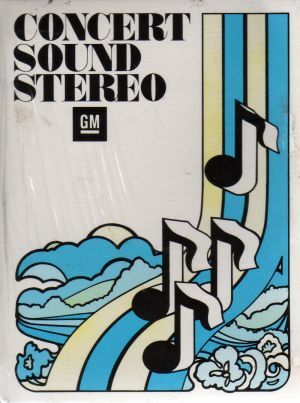 If your car came with the AM/FM 8-track Stereo option, the Concert Sound Stereo tape was included. 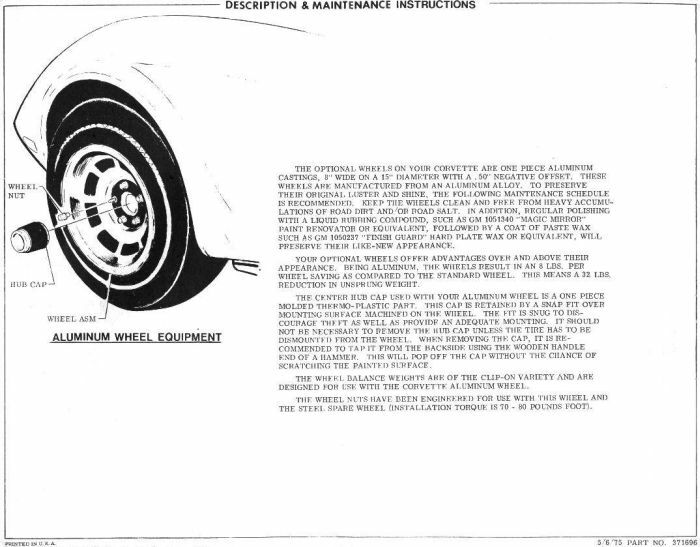 If your car came equipped with the aluminum wheel option, a one page document discussing the proper care of the wheels was included with the car's other documentation. If your car was delivered with the luggage rack option, a set of roof panel mounting brackets were packed in a plastic bag in the rear compartment. Also, in the bag was an instruction sheet showing how the brackets attached to the rack and how the roof panels are to be anchored. When your Corvette was delivered to the dealer, a window sticker was attached to the passenger side window. This sticker listed all of the options, the cost of each and the total retail price of the unit. 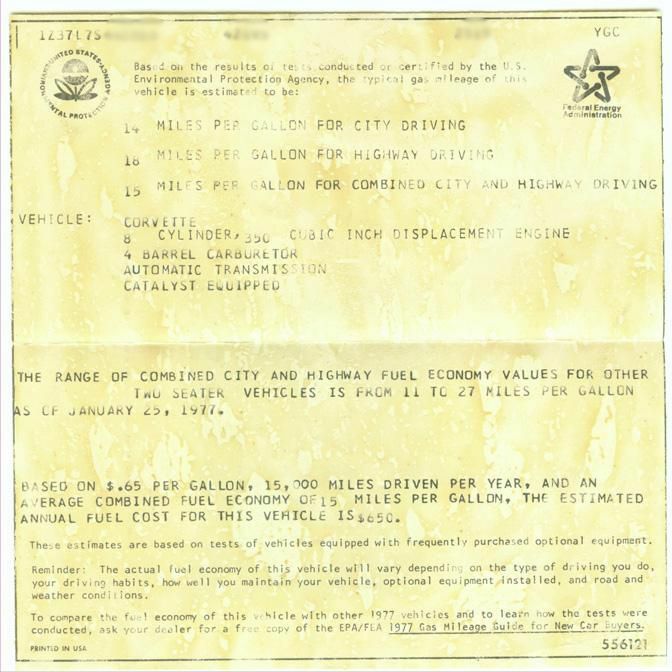 The EPA document was placed on the passenger side window to the right of the window sticker. 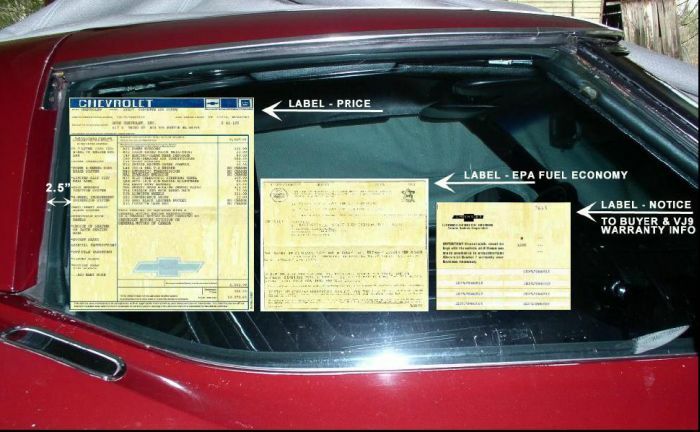 This picture shows the placement of the documentation on the passenger window. 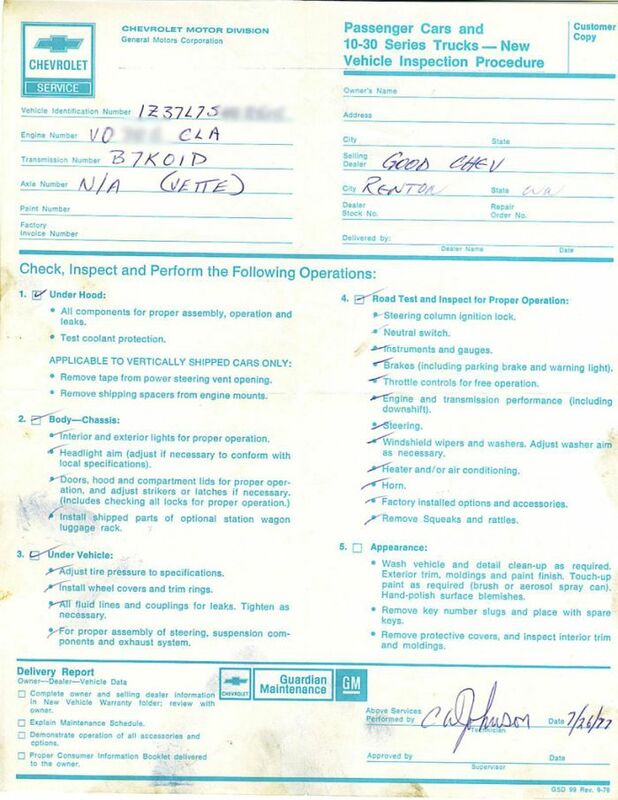 This is a copy of the dealer inspection form that was completed by the technician before the car was delivered to the new owner. 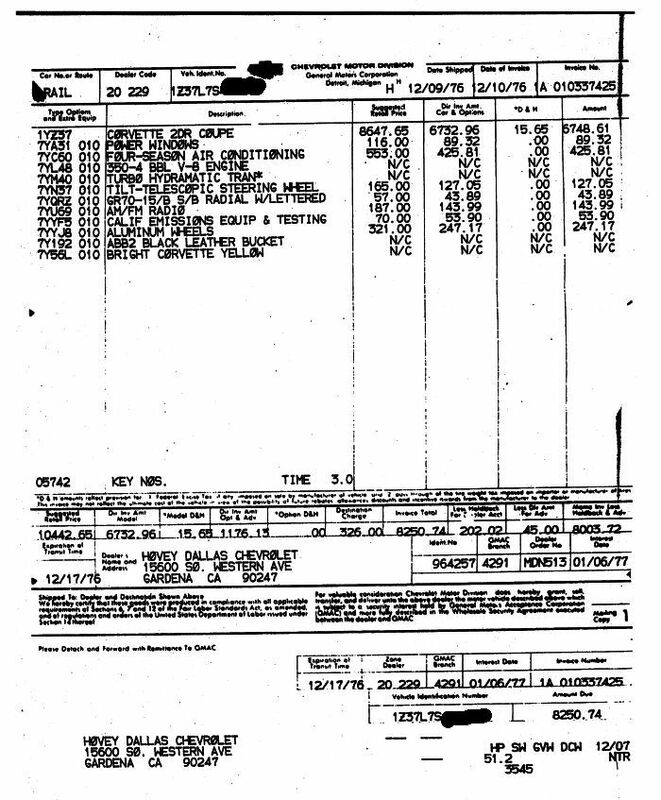 This is a copy of the original dealer invoice for my car. These were available free from GM for a number of years but now they are being processed by a third party for a fee of $50. 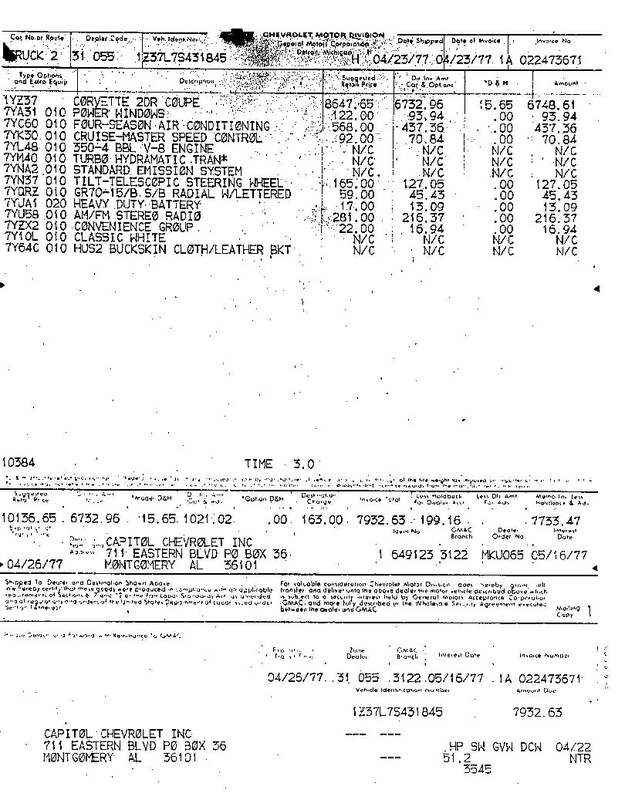 This is a copy of another original dealer invoice for a later '77. You will notice a price increase in some of the options. Build sheets have been found in a few different locations. 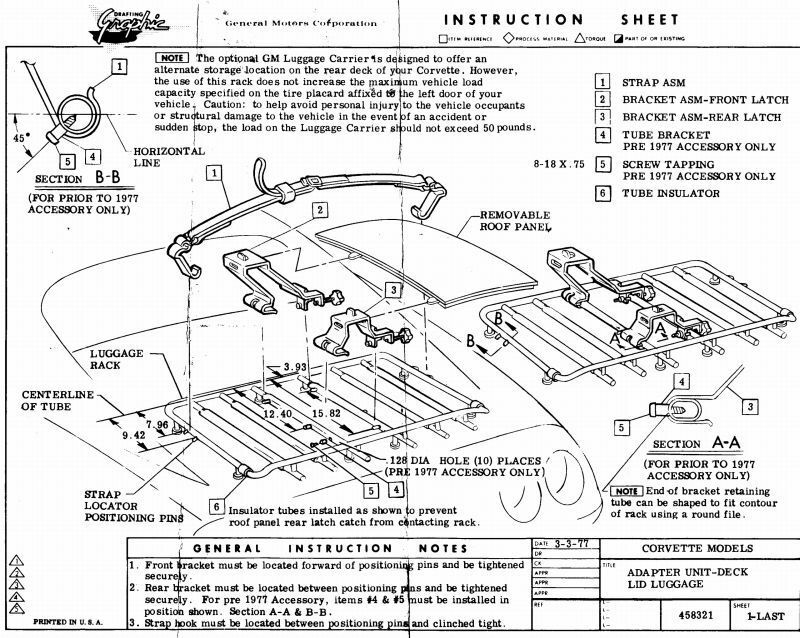 The build sheet was the 'blueprint' for the car and listed the options that were to be installed as it moved along the assembly line. It also included the dealer code and dealer name if the car was a dealer order. The most popular place to find a copy of the build sheet is on top of the gas tank. However, as you can see by mine on the left, after 30 years of exposure to the elements, the sheets may be difficult to read. I damaged mine during the retrieval process. Build sheets have also been found under the carpet and stuffed between the speedometer and tachometer. My car was delivered to Hovey Dallas Chevrolet in Gardena, California.